Hunter's Creek is a small community of homes built in the last ten years, located off Cates Bay and Willow Springs Rd, southwest of Conway's downtown. The development is built in a loop that surrounds a lake, giving many of the homes a beautiful lake view. What stands out with these homes is the price, and how much house you get for it. These 3-bedroom, 2-bath homes have large lots, so large that many have private pools in the backyard. the homes themselves have upgrades like many luxury homes, including trey ceilings, hardwood flooring, walk-in closets, and covered patios. 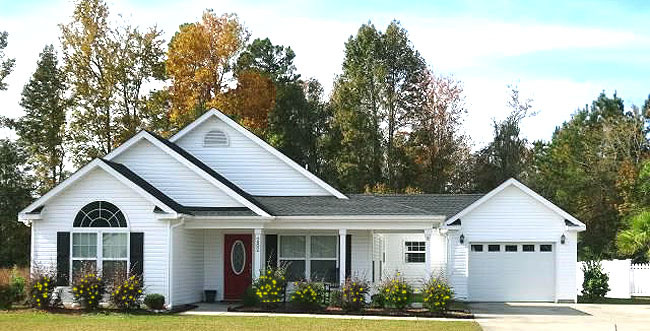 Vinyl siding makes for a maintenance-free exterior. The streets have sidewalks and lighting. It is outside the city limits, so taxes are low, and the HOA fees are less than $20. Children attend South Conway Elementary, Whittemore Park Middle School, and Conway High School. Home prices range from $150,000 to about $175,000 for 1400 to 1500 sq ft. If you're looking for an affordable home, especially with a water view, this is an excellent place to begin your search. Convenient to everything in Conway, you'll have restaurants, shopping, and businesses just a short drive away. Call us for a tour of the homes for sale in Hunters Creek!